This article is a home school teacher's (Donna Young) perspective on the curriculum Unit 7 Comics. Supply lists, scheduling suggestions, and time estimates are included. About the minimums and maximums in the supply lists: In the supply lists, I have included minimums and maximums for the items and I hope this does not confuse you. A minimum item is a perfectly acceptable item for a student. The items in the maximum range are closer to what a professional would use. Unit 7 Comics is part of a 10-book art curriculum set AOP LifePacs Art Electives, but it is also sold separately. The 10-book set is explained at About AOP LifePac Electives Art. 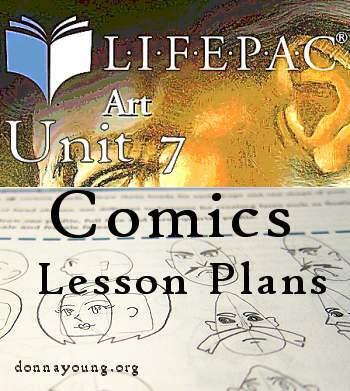 "Lifepac Art Unit 7 covers comics, including how to draw parts of the cartoon figure, layout and design of the panel and camera angles, composition, backgrounds, text and more. 35 pages with glossary and evaluation, paperback. For Grades 7th-12th"
Time estimate: This class will take around 25 days or 5 weeks if the student does not do any extra work. This time estimate allows 7-9 days for activity 3.1. Field Trips: Activity 2.5 [page 20]: Go to a place where people assemble and can be unobtrusively observed and sketched. Paper: For this class, use paper that accepts pen & ink. Pencils: A hard pencil, one labeled with #H such as 2H. The pencil can be a mechanical pencil or a wooden pencil. Drawing Surface Minimum: A drawing pad, or a table with a flat, hard, smooth item that is placed under the drawing paper. The absolute minimum supplies for this class: 2H pencil, eraser, 12-inch ruler, a drawing pad that can handle ink, and a rolling ball black ink pen. *I listed the maximums so that you could see the range of quality within the supplies and so that you could match the supplies to the students level of interest. In other words, a student who draws comics already and has for years drawn comics might prefer the maximum supplies. A student who is new to drawing cartoons or has little interest can use the minimum supplies. If your older student enjoyed this class, look into Drawing Words and Writing Pictures by Jessica Abel and Matt Madden. "Drawing Words and Writing Pictures is a course on comic creation – for college classes or for independent study – that centers on storytelling and concludes with making a finished comic." First ask yourself: "How much time can we devote to this Unit?" Below are three If's. -If you are completing the entire 10 units of AOP Electives Art in this school year, then time is limited to 3.6 weeks or 18 days if you are on a 180 day Monday through Friday school year schedule. Heads-up- My rough estimate for the time that this class will need is 5-weeks minimum. -If you are setting aside one quarter for this unit, then that is how much time you have. A typical quarter is 9 weeks. -If this is a "finish when we finish" course, then there you go, your schedule will be open ended. A Fact About the Book: There are 35 printed pages in the unit, but we do not go by the pages divided by the days to make a schedule for this unit. We have to look at the pages to determine how much the student might do each day. Drawing Notebook Question: Will your student maintain a notebook for this course? If so, set that up. Go over the glossary [page 34] and go over the objectives on page one. Depending on remaining class time - have the student either read the entire unit or spend the rest of the class time reading/scanning the book. Head I think emanata should have been covered. Emanata examples: marks that indicate sweat, tears, motion lines, etcetera. Cliches are defined at the beginning of Head with glass cliche examples. Head covers shapes, angles, expressions, and profiles. 1. Read through page 5-11, if using a notebook, make notes. - (4. Unofficial activity)- If you are not in a hurry, the student should refer to page 9 and practice drawing facial expressions. If you own the book mentioned below, use it at this time -(optional). Outside Book- Optional- If the student has the book, Making Comics by Scott McCloud, use that to explore drawing facial expressions. The student could start on page 62, but the bulk of facial expression starts on page 80. Body It is possible to combine Body with Foreshortening since there are no activities for either, yet, and if the student is not keeping a notebook. Body has only a few pages and no activities (yet), but you could assign drawing activities so that the student can practice what is mentioned on the pages. At the very least, the student could start a new page in a drawing notebook for each item mentioned on the pages and draw examples for each item. A short bit that is about a common drawing obstacle, foreshortening. Drawing foreshortened items should, and needs, to be practiced by the art student, if not now, then later. Unit II Activities I have reservations about the usefulness of Activity 2.6. Perhaps I just do not like anything that involves looking though periodicals for examples. At the end of section II are five activities Activity 2.3, Activity 2.4, Activity 2.5, Activity 2.6, and Activity 2.7. Your call on this suggestion -Consider allowing one class per example - this would mean 5 classes for Activity 2.7 instead of 1. Undetermined amount of classes, but let us estimate 4 days of class time and 7-10 days for Activity 3.1. Please Note: If the student is making notes and drawings in a class notebook, parts A-E could take more than one class. Activity 3.1 begins on page 28 and is explained at length. The student should read pages 28-32 to get an idea of how the project should flow what to do first, then second, and so forth. You might notice right away that there is a tiny problem with step I The Story B. is not covered in the book, however; that part should be easy enough to figure out. Self Test 3 1 or 2 classes - Will student have a day to study for test or will the student take this test after completing Activity 3.1? Unit Test. The student should study the day before and the test should be closed book. Time estimate for this class: 25 days or 5 weeks minimum This is without extra practice work that I suggested. Note: In the Teachers Guide Appendix, starting on page 112 is a section on Evaluating the Students Work. Despite this article being a "guide," I will provide a basic lesson plan; it is linked below. The lesson plan is a simple checklist and it does not include any of my suggestions for additional work. I have to say though that I want you to read the guide that I wrote above starting here. For V Planner - after pasting into S Sheet, Column B, select "Match Destination Formatting" if pasting has caused the background color to change. See illustration below, click illustration to see full sized image. Edit the list as you see fit. Although there are 24 boxes, this does not represent 24 days. Some items can be combined, while more items in the list could take more than one class. Activity 3.1 parts Ia and Ib Begin by discussing parts Ia and Ib with the instructor, if the feedback is good start the work. Activity 3.1 part II Show the preliminary sketches to your instructor for feedback. Activity 3.1 part III Show your work daily or every other day to your instructor for feedback.